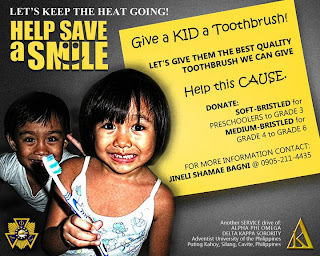 ALPHA PHI OMEGA DELTA KAPPA FRATERNITY AND SORORITY CHAPTER OF THE ADVENTIST UNIVERSITY OF THE PHILIPPINES @ THE "HELP SAVE A SMILE SERVICE PROJECT "
MORE THAN 50 CHILDREN HAD BENEFITED IN THE CONDUCTED DENTAL LECTURE AND PROPER TOOTH BRUSHING TECHNIQUES LESSON. FREE TOOTH BRUSH AND TOOTHPASTE WERE GIVEN OUT AND A RETURN DEMONSTRATION WAS ALSO DONE AFTER THE LECTURE. THE KIDS ALSO ENJOYED GAMES AND STORIES PREPARED BY THE RESIDENTS. EVERYONE APPLAUDED THE PRESENTATION OF THE JUSTINE BIEVER OF DELTA KAPPA ( BROTHER ALDRIN ). THE SKY SHOWERED SOME RAIN BUT AT THE END OF THE DAYS EVERYONE IS HAPPY AND FULFILLED BY ANOTHER "SERVICE STAND STRONG" OF DELTA KAPPA CHAPTER! AND THIS WOULD NOT BE POSSIBLE WITH OUT THE UTMOST HELP OF OUR SPONSORS.. DEAR SPONSORS THE RESIDENTS AND THE KIDS OF BRGY SAN FRANCISCO WOULD LIKE TO EXTEND THEIR OUT MOST APPRECIATION OF YOUR UNSELFISH DEEDS.. MORE POWER AND GOD BLESS!! BRUSH ! BRUSH ! BRUSH !